As I mentioned in my Scannicchio’s post, my father’s dear friend and his daughter came to visit Philadelphia a few weeks back. 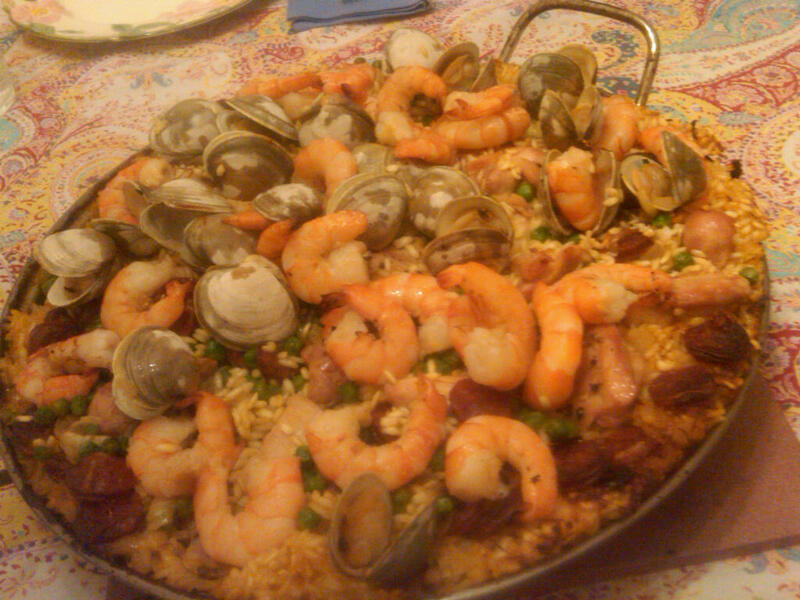 Last time my parents went to visit Pat in New Hampshire, they came home raving about his paella made entirely on the grill. Sounds interesting, I thought. My mother made her own delicious version this past summer but I knew I had to try the original. 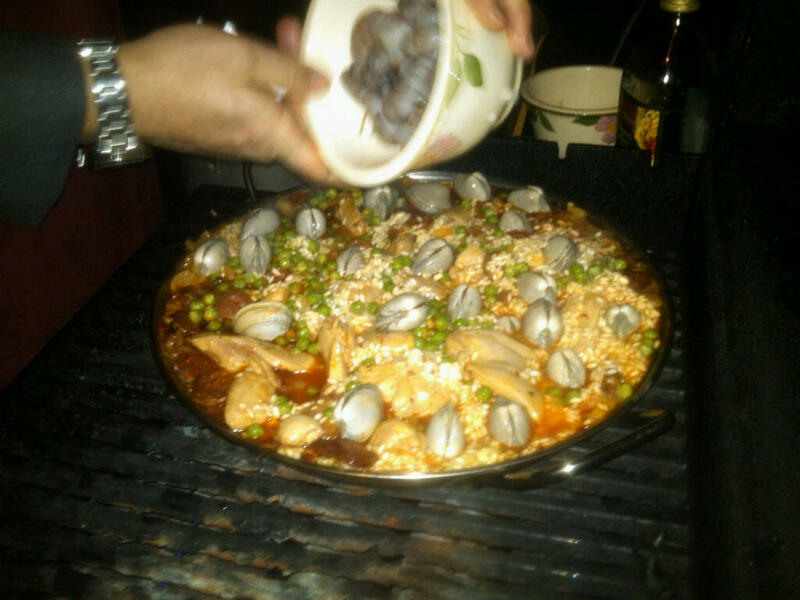 On a cold weekday evening, my husband, dog and I made our way to my parents’ house to finally see what this paella was all about. Pat had spent the day touring colleges but made sure to hit up the Reading Terminal (my family’s go-t0 spot) for lunch and a little grocery shopping. 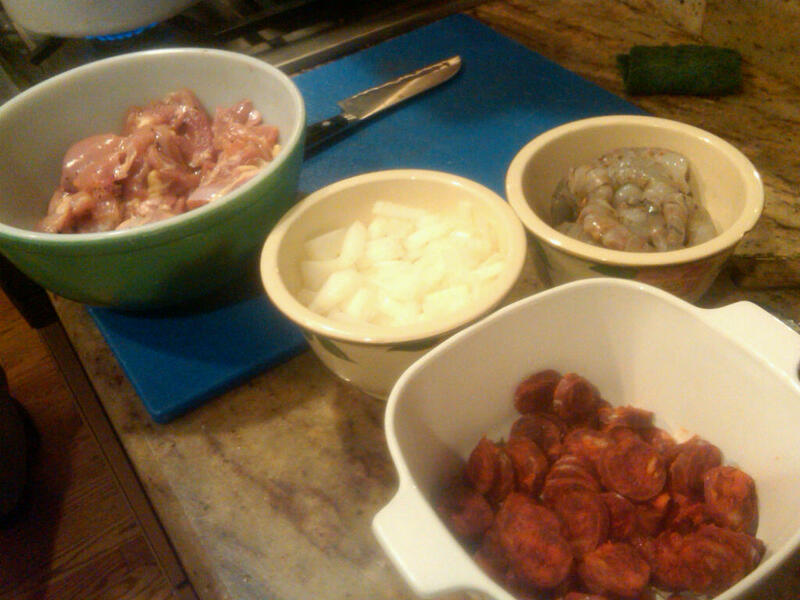 By the time my husband and I got my my parents’ place, Pat had already prepared his mise en place of chicken, onion, chorizo and shrimp. 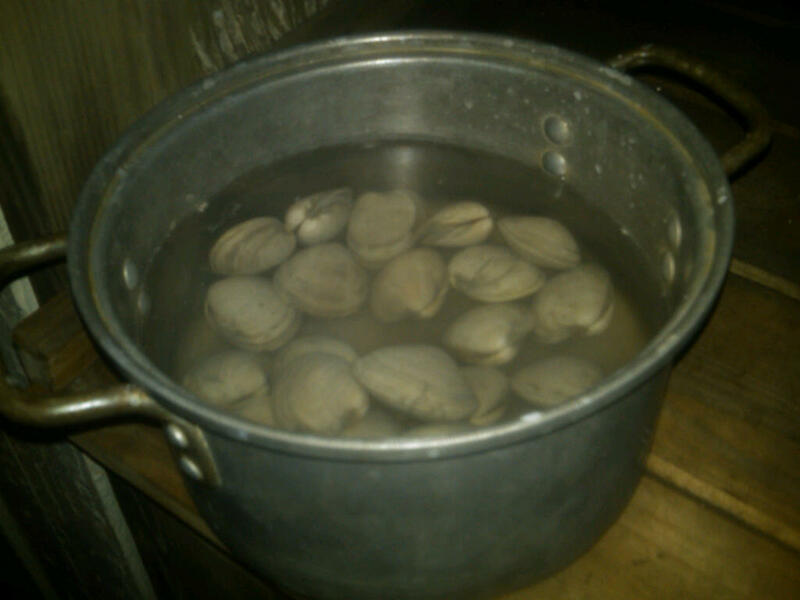 The clams were outside soaking in salt water. Pat’s theory is that the clams would feel more comfortable in a “natural habitat” and would thus be more likely to loosen up and release any sand and grit. Who knows. 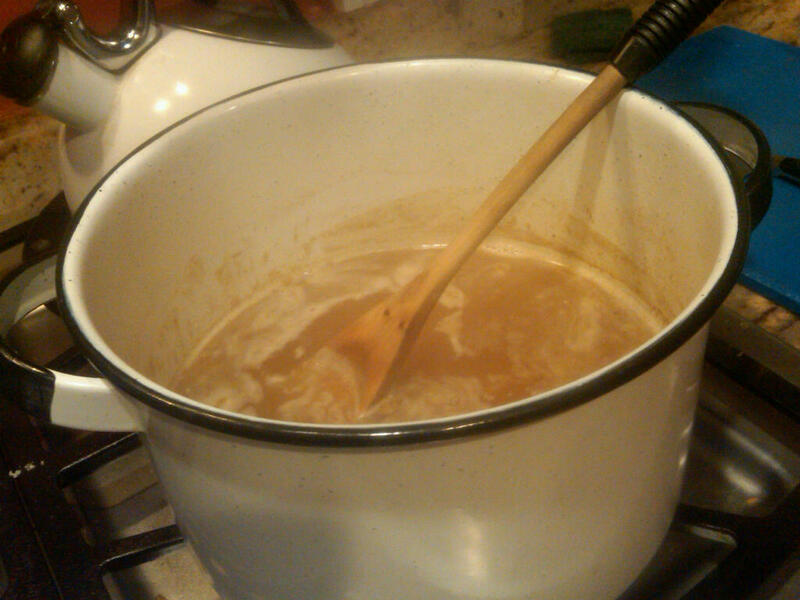 Meanwhile, my dad’s homemade chicken stock (go Dad!) was bubbling away on the stove. Check out the rich, caramel color! Finally it was time to bring the ingredients out back to the grill. Pat began by sautéing the onions, chicken and chorizo in the pan in a small amount of olive oil. The point is to infuse the olive oil so that when the roast is toasting, it takes in all of the delicious flavors of the onions and proteins. While Pat was busy working out back, we were busy inside. Just another Wednesday night, y’all. Next, Pat toasted the rice in the flavored oil with added saffron. 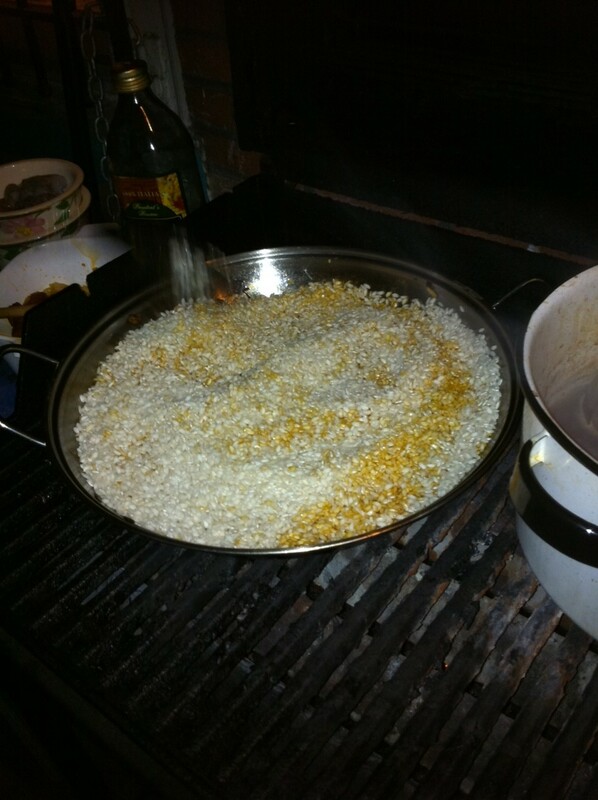 He used arborio (risotto rice) because it is the closest to the specific Spanish rice that he could find. 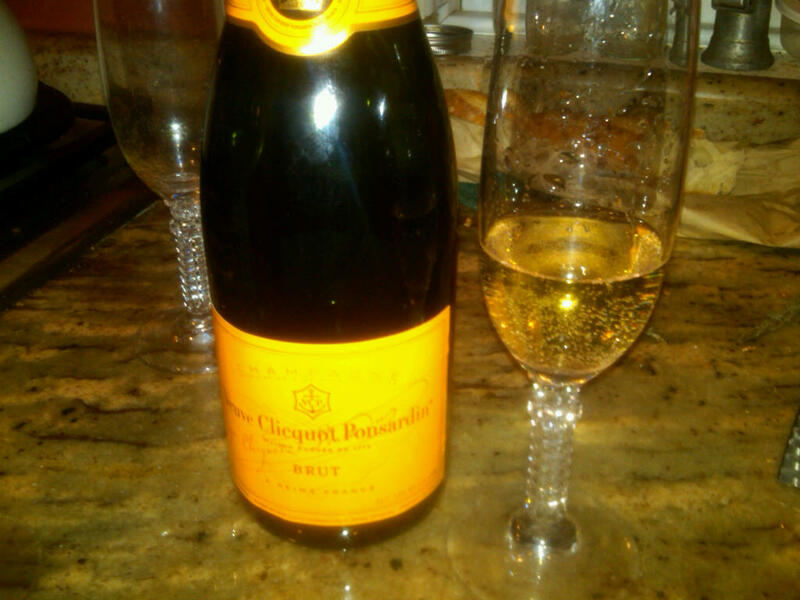 We closed the grill and finished off the last of our champagne. After a brief but impatient wait, the finished product was brought to the table straight from the grill. Beautiful! My favorite parts were the crispy rice and chorizo. 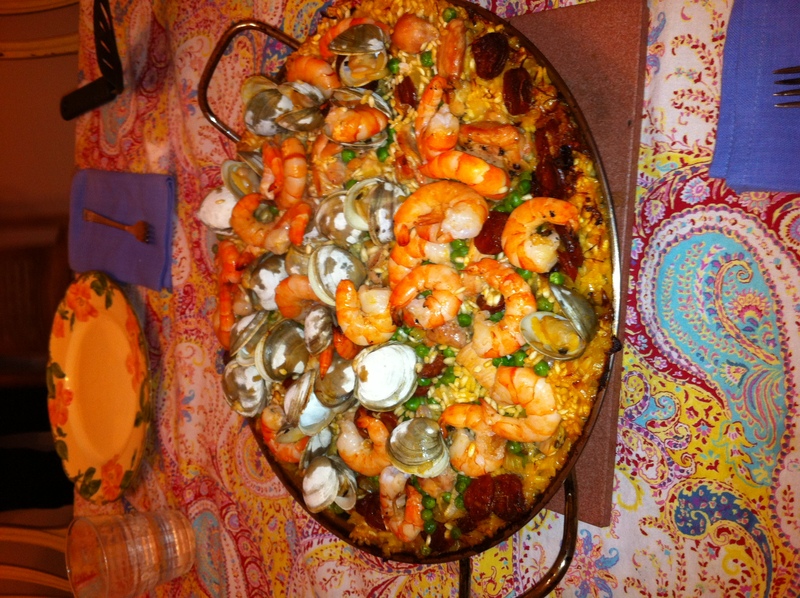 Zoe — What a compliment for “my” paella to appear in your blog! Thanks for the introductions to so many other delicacies…I ordered the Arancini locally, the Italian Rice Balls that were so delicious in South Philly, and was disappointed, but glad to know what was wrong (other than not being in Philly): they need to be hot-hot-hot to keep the cheese molten inside. 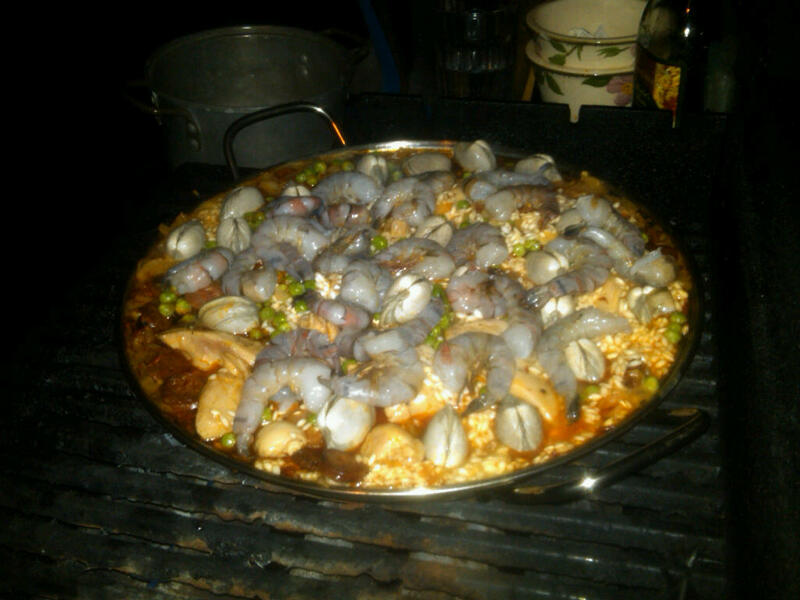 My only reservations regarding your paella post — timing is everything…the rice and peas mixture will cook over the right temperature grill in about 30 minutes so everything needs to go into the mix bearing that in mind…usually during a period of about ten minutes at the start will do it, rather than waiting for the rice to cook thru… chicken and chorizo in first, shrimp and clams in last so the cook has about 20 minutes to have a nice glass of rose, checking occasionally to assure the rice doesn’t get dry too fast, pouring in hot chicken stock or a little more rose to keep it moist. But not too much! The real test of a proper paella is the “toasty rice” crust, called “Saccarat,” that you enjoyed so much, which will be undermined by too much liquid. The recipe is an adaptation of one that appeared in the NY Times Sunday Magazine a couple of years ago. 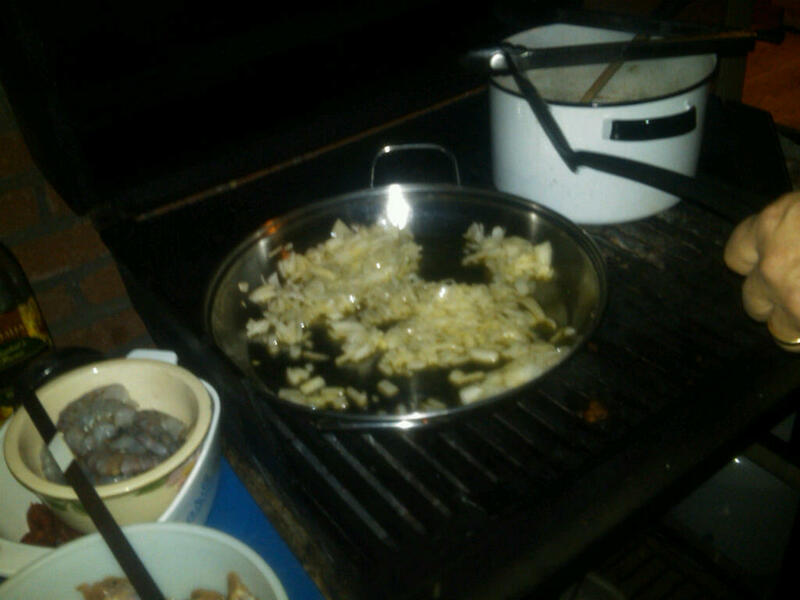 It is remarkably easy — but a paella pan is essential! 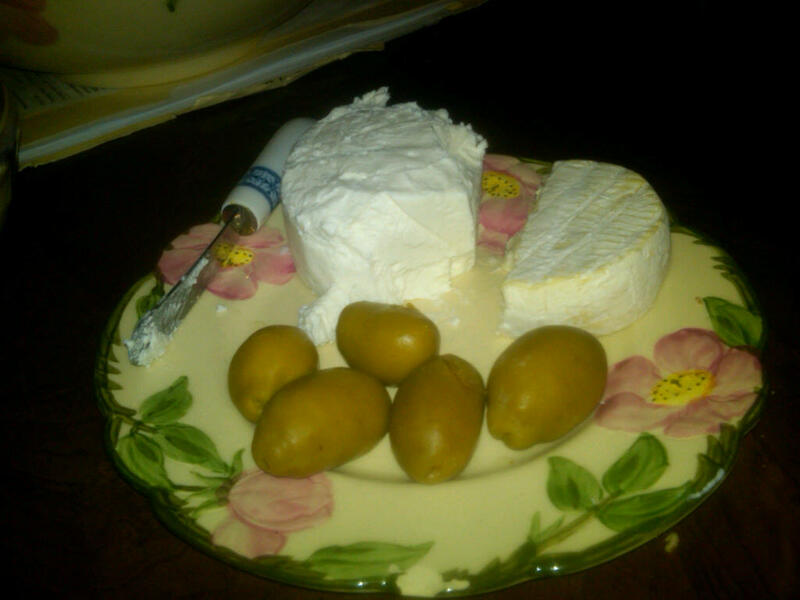 You’re the greatest, the Tolstoy of food blogging! That looks gorgeous from start to finish. And champagne to boot! This might be my favorite dish on your entire blog.. Although a few come very close on the scale this takes the cake (The kind without flour.. HA!) I was in love with this meal from start to finish I would LOVE to taste and or make this one day. 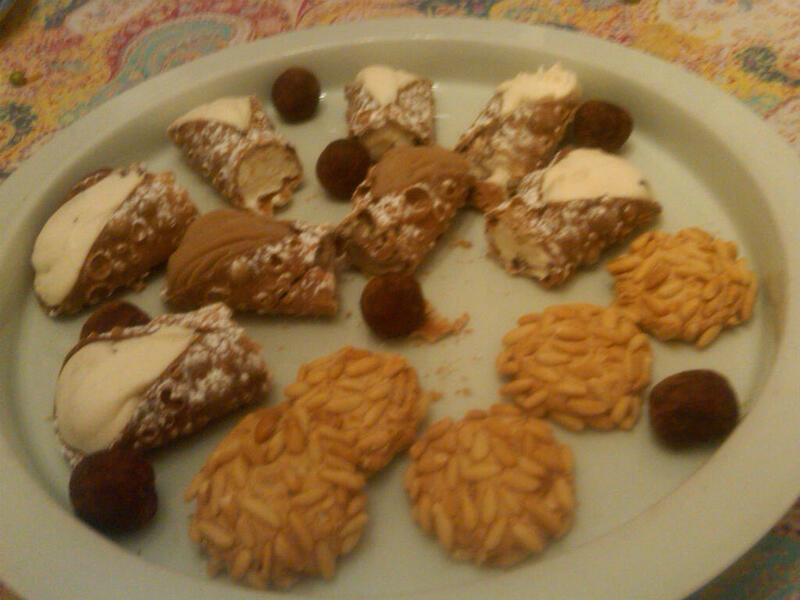 The cannoli for desert was the icing to the cake… I just absolutely adored this meal!